This map shows general watershed areas where native cutthroat trout occur across Utah. Each shaded area represents the range one of the cutthroat subspecies, which you can determine by color. Use this map as a general guideline to find where cutthroat might be found. This is fishing; there are no guarantees. More research regarding access and specific fishery regulations should be done. Wheeler Creek. Angling conditions can be tough as Wheeler Creek is a small, brushy stream. Wolf Creek. Angling conditions can be tough as Wolf Creek is a small, brushy stream. South Fork of Little Dear Creek (downstream from Deer Creek Reservoir). Angling conditions can be tough as the South Fork of Little Deer Creek is a small, brushy stream. 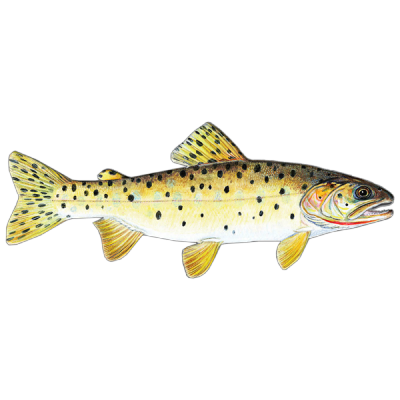 The Weber River and its’ tributaries from the town of Oakley, UT upstream to the headwaters is managed by the UDWR for native cutthroat trout (Bear River/Bonneville cutthroat trout). Johnson Creek: Brook trout were chemically removed from this stream in 2013-2014. The genetically pure population of YCT located in the headwaters is beginning to build in numbers and slowly disperse downstream. For the next few years, the concentration of YCT will be in the headwater tributary, the Left Hand Fork, however, YCT will be present throughout the Sawtooth National Forest portion of this stream in the near future. Onemile Creek/Sawmill Canyon: Yellowstone cutthroat trout are the only species of trout in Onemile Creek and its’ tributary, Sawmill Canyon. Yellowstone cutthroat trout occur in good densities in both of these streams on the Sawtooth National Forest, but angling conditions can be tough as these are small, brushy streams. Wildcat Creek: Yellowstone cutthroat trout are the only species of trout in Wildcat Creek on the Sawtooth National Forest. The population of YCT has been depressed since a wildfire in the mid 2000s, however YCT that would have been lost in the chemical treatment of Johnson Creek recently were transplanted into Wildcat Creek during 2012-2013. These fish should help this population continue to build post-wildfire. The best bet to catch fish in this stream is in the headwaters, downstream from the two headwater forks. Angling conditions can be tough as Wildcat Creek is a small, brushy stream. For those unfamiliar with this part of Utah, please contact the Northern Region Office (801-476-2740) and ask for a fisheries biologist that can discuss streams in the Raft River.